This article written by Dr. Reynold Bergen, BCRC Science Director, originally appeared in the January 2019 issue of Canadian Cattlemen magazine and is reprinted on the BCRC Blog with permission of the publisher. Youthful carcasses from feedlot-finished cattle are graded for yield (amount of meat in the carcass) and quality (marbling score). Federal grading began during World War II to ensure quality standards during wartime price controls. 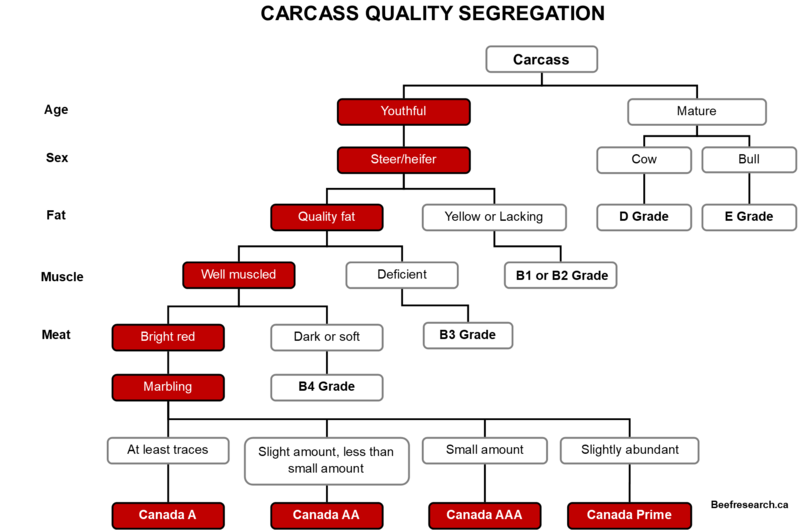 Canada’s last major beef grading change occurred in the early 1990s, when Canada added quality grades to the grading system. Canadian and US beef quality grades are quite similar (i.e. A vs. USDA Standard, AA vs. USDA Select, AAA vs. USDA Choice and Canada Prime vs. USDA Prime), but Canadian and US yield grades currently predict different things. Canada’s three yield grades predict “lean meat yield” (the percentage of red meat in the entire carcass). This essentially estimates the edible part of the carcass, at least for those consumers who trim the external and seam fat from their steaks and roasts and drain their ground beef. In contrast, the US has five yield grades (YG1 to YG5) that predict the “retail yield” of the four largest primal cuts (chuck, rib, loin and round) that make up 81% of the beef carcass. Unlike Canada’s lean meat yield, US retail yields account for the fact that beef sold in retail stores still carries some fat trim, as well as regular, medium and lean ground beef. The differences between Canada’s lean yield and US retail yield grades has caused some confusion and frustration in cross-border trade. On January 15, Canada will change from three “lean meat yield” grades to five “retail yield” grades. Because both the definition of yield and the number of yield grades are changing, Agriculture and Agri-Food Canada’s Lacombe Research & Development Centre worked with commercial packers in Canada to assess how the distribution of Canada’s yield grades may change when the new system is adopted. What they did: 867,861 carcasses from fed cattle were graded using both Canada’s three lean yield grades and the five US retail yield grades, and the results from the two systems were compared. Another 700 research carcasses were graded for lean and retail yield, fabricated into retail cuts, then fully dissected into lean, fat and bone to validate the grades. This cut-out work is very time-consuming and costly, but these data were also used for several other research projects. This was an efficient use of data and resources. What they learned: Using Canada’s lean yield grades, 50.7% of carcasses graded Canada 1 (leanest), 33.7% graded Canada 2, and 15.6% graded Canada 3 (fattest). Using the US retail yield grades, 19.6% graded YG1 (leanest), 41.9% graded YG2, 30.1 were YG3, 7.5% were YG4 and 0.8% were YG5 (fattest). They also compared how carcasses graded under Canada’s lean yield system would have graded under the US retail yield system. Carcasses that graded Canada 1 primarily graded as US retail YG1 (35.6%) or YG2 (51.9%). Canada 2 carcasses mainly graded as US retail YG2 (41.6%) or YG3 (48.4%). Canada 3 carcasses mostly graded as US retail YG3 (49.3%) or YG4 (34.8%). The five retail yield grades can be easily programmed into the camera grading technology used in large commercial plants, and a new handheld grading ruler has been developed to allow smaller plants to implement the grades as well. What it means: In addition to facilitating international beef trade, expanding the number of yield grades will allow packers to identify higher value carcasses and help producers adjust their management practices accordingly. Some important legislative changes have also occurred. Previously, beef grading fell under the Canada Agricultural Products Act, while the Livestock and Poultry Carcass Grading Regulations defined the exact levels of marbling score required for each quality grade and the specific lean meat yield percentages required for each yield grade. This meant that creating a new grade, re-defining an existing grade or eliminating an irrelevant old grade required a full public consultation and regulatory change. That can take a very long time. Beef grading now falls under the new Safe Food for Canadians Act and Regulations, with one particularly important difference. The new regulations refer to a Grade Requirements Document that defines the specific beef quality and yield grades. The Grade Requirements Documents is developed and maintained by the Canadian Beef Grading Agency (CBGA). The CBGA is not a government body, so future changes to grade definitions can be made more quickly, without needing to revise the Safe Food for Canadians Regulations. The Canadian Beef Cattle Check-Off has increased from $1 to $2.50 per head in most provinces, with approximately 75 cents allocated to the Beef Cattle Research Council to support research. Canada’s National Beef Strategy outlined why the Check-Off increase was needed, and how it would be invested. In Canada’s National Beef Strategy, the first target outcome under the Beef Demand pillar’s “Validate and Enhance the Canadian Beef Advantage” focus area is to benchmark Canada’s beef carcass quality and yield relative to international competitors. These changes to Canada’s grading system will help international markets fairly compare both the yield and quality of Canadian and US beef. The Beef Research Cluster is funded by the Canadian Beef Cattle Check-Off and Agriculture and Agri-Food Canada with additional contributions from provincial beef industry groups and governments to advance research and technology transfer supporting the Canadian beef industry’s vision to be recognized as a preferred supplier of healthy, high quality beef, cattle and genetics. The sharing or reprinting of BCRC Blog articles is typically welcome and encouraged, however this article requires permission of the original publisher. This entry was posted in Other Research by Beef Research. Bookmark the permalink.